Alright guys sounds like we've got some things to clear up when it comes to Silhouette Studio updates and upgrades. Now's a good time to have this chat since Silhouette America just released a new update for Silhouette Studio. 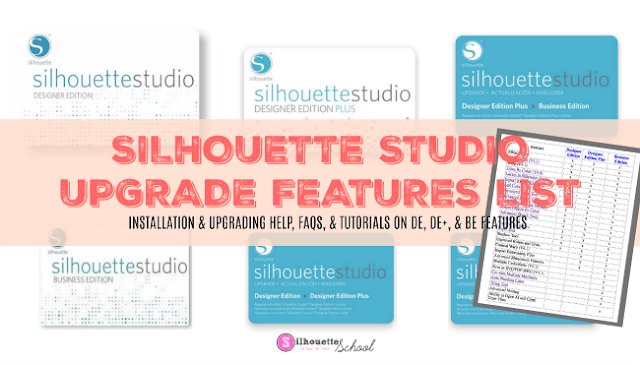 There are some key differences when it comes to Silhouette Studio Updates vs Silhouette Studio Upgrades - the biggest is updates are free and upgrades are a one time fee. But that's not the only difference... so let's get to the bottom of this. Silhouette America provides free software - Silhouette Studio - for all users. The software is available for download directly from the Silhouette America website. As of this writing, the current version of the software is Silhouette Studio V4.1.468. When the next version of the software is released, that will be a free "update." It will be called something like Silhouette Studio Version 4.1.5XX or 4.1.6XX. Later this fall Silhouette will release what I like to called a "Moderate" update known as Silhouette Studio V4.2. Minor Silhouette Studio updates are the most common and most frequent type of Silhouette Studio update. They are typically released to fix bugs in previous versions of the software. I put any update that changes the number after the second "." in the Minor Update category. For example the most recent software release took the "current" version of the software from V4.1.206 to V4.1.468. The software updates are outlined in the Release Notes. Moderate Silhouette Studio updates are the second most common type of updates released by Silhouette Studio....but are far less frequent. 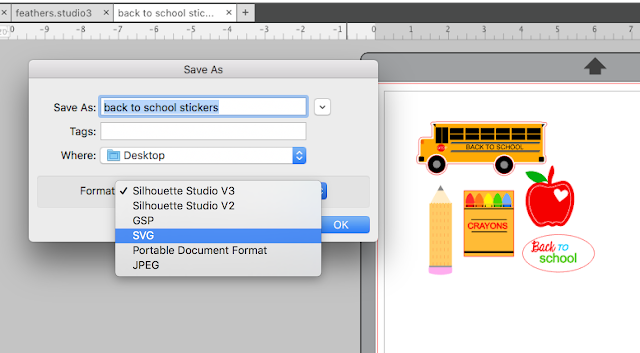 Moderate Silhouette Studio updates not only fix bugs, but also include the roll out of new features. The most recent major Silhouette Studio update was the release of V4 in June 2017. Prior to "V4", Silhouette Studio users were using a version of "V3". If you are a newer user, this is why you may find Silhouette tutorials in which the software in the tutorial looks different than the version you are using. Major Silhouette Studio updates have changed the look, layout and flow of the software to improve the user experience. However, while it can be jarring when tools, toolbars, and panels are move around in the software, in general, the software works the same way. While updates are free and available for anyone to download - keep in mind even when moderate and major updates roll out new features - you may not be able to access all of the features. That's because some features in updates are only unlocked with an upgraded version of Silhouette Studio. Silhouette Studio upgrades require a one-time paid fee. There are three upgrade levels: Designer Edition, Designer Edition Plus, and Business Edition. The upgrades are delivered as a 16 digit license key. Users can upgrade to any software edition from any other software edition. For example, you can upgrade directly from the free basic Silhouette Studio to Business Edition. Likewise, if you previously upgraded to say, Designer Edition, you can later you purchase a partial upgrade (at a pro rated fee) and upgrade from Designer Edition to Business Edition. Each level of upgrades unlocks additional features with the higher level upgrades not only unlocking their features, but also the features of the lower upgrades. In other words Designer Edition Plus gives you access to all standard Silhouette Studio features along with Designer Edition features and Designer Edition PLUS features. One of the most common questions about upgrades is "Why is a feature in an upgrade not available even though I have the right upgrade?" Let's say the user has Business Edition but does not have the option to export as an SVG. This happens when the user has the upgraded software edition (BE), but does not have an updated version of the software. This particular example would occur if the user was using a version of the software PRIOR to V4.1 since Save as SVG was a feature that rolled out to BE users in that "moderate" update. 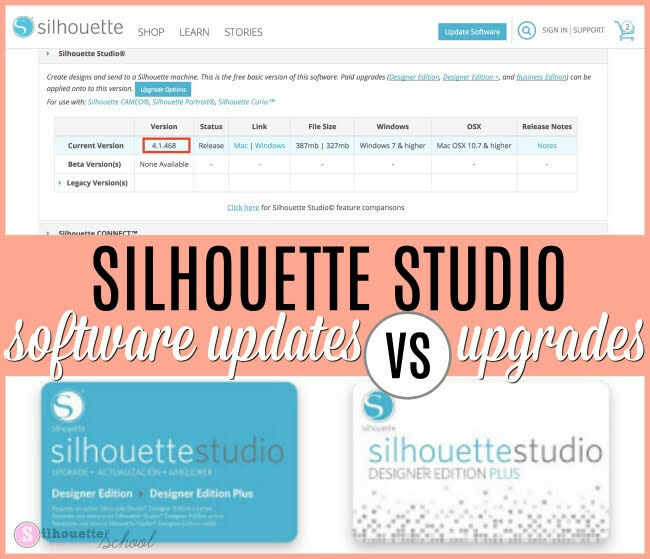 Now that you understand the difference between Silhouette Studio updates and upgrades, it's important to find out what software version you are using. If you're not sure which version of the Silhouette Studio software you are using, takes these simple steps to check.